The fastest tissues are the lungs, which achieve equilibrium almost instantly. Blood follows in speed, then the brain. 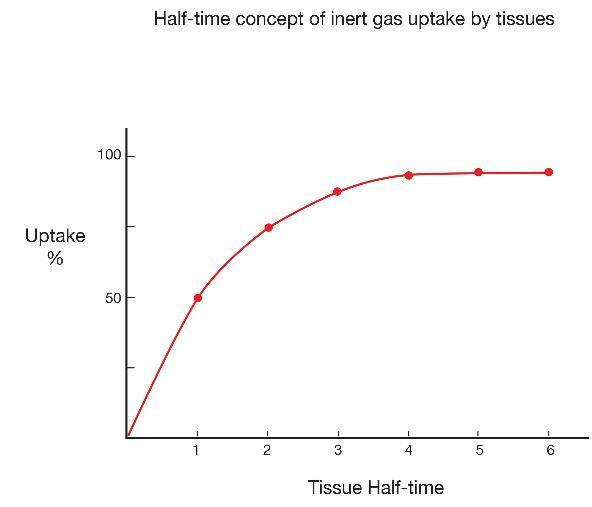 The slowest tissues are those that are relatively poorly perfused, such as ligaments and cartilage, or those that have a high capacity for inert gas uptake, such as fat in poorly perfused areas. The reason for using a mathematical algorithm to estimate tissue status is that it is not yet practical to directly measure uptake or elimination in specific tissues. 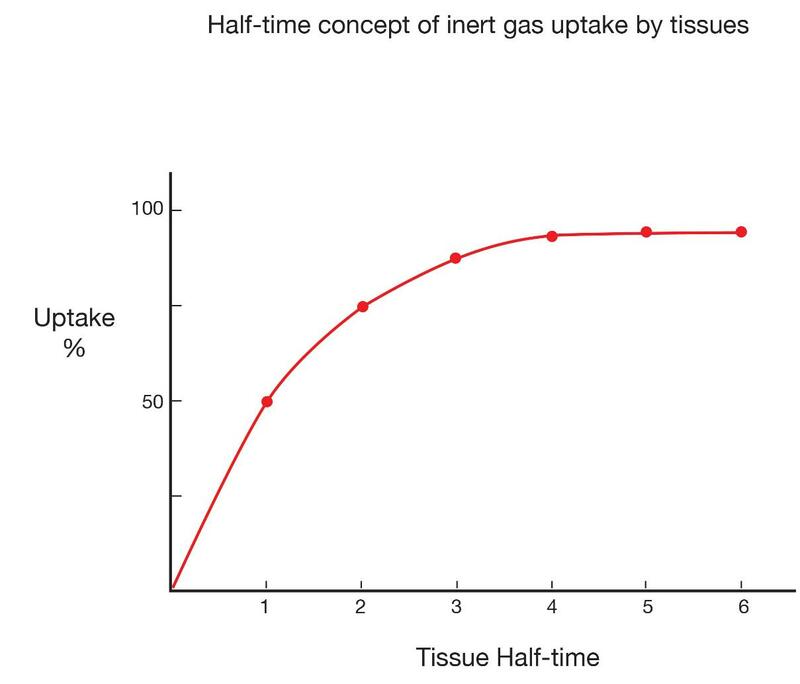 For a theoretical tissue with a half-time of 10 minutes, 50 percent of the difference is eliminated in the first 10 min, then 25 percent in the next 10 min (half of the remaining 50 percent), then 12.5 percent in the next 10, and so on. An example may demonstrate how the algorithms work. 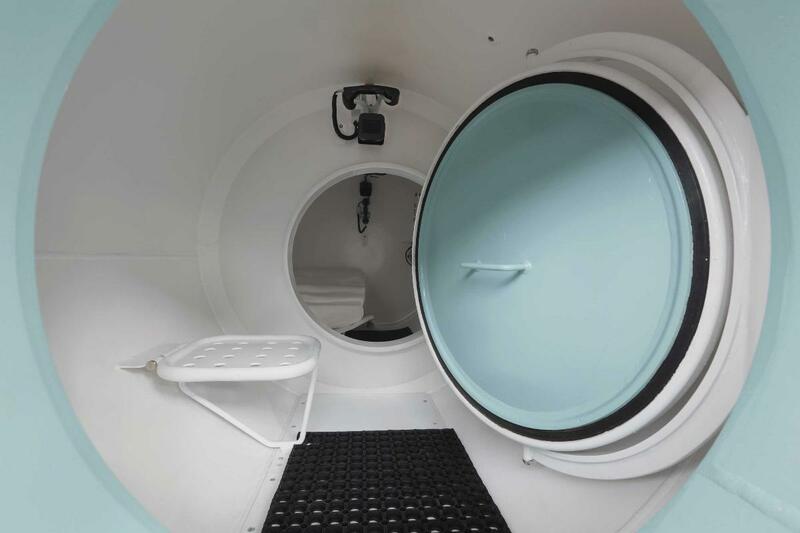 Let us imagine a diver who has been instantly displaced from the surface to a fixed depth — effectively, a fixed pressure — and let us say that in this particular dive scenario, a fast compartment has a half-time of five minutes. In such a case, the first five minutes of exposure to the higher pressure would result in sufficient inert gas uptake to eliminate half of the difference produced by the pressure gradient (50 percent, in other words); this is the steepest portion of the uptake curve. The second five-minute period would eliminate half of the remaining difference (another 25 percent). The third five-minute period would eliminate half of the remaining difference (12.5 percent); the fourth, 6.25 percent; the fifth, 3.125 percent; and so on. This exponential pattern means that the rate of change becomes progressively slower as the magnitude of the difference decreases. The example described a fast compartment; half-times for slow compartments have been computed in some algorithms out to almost 500 minutes. In decompression theory, the absolute difference in pressure is immaterial — the same half-time construct applies to any gradient. With no additional influences on the process, equilibration, or saturation, would be achieved in a period equal to about six half-times. As gas dissolves in the tissue, the difference between the external pressure and internal pressure decreases, reducing the driving force. Most dives do not last long enough for the diver to reach saturation — these are known as "bounce dives." During such exposures, the inflow gradient exists throughout the descent and bottom phase of the dive, which causes continued uptake of inert gases, certainly in the body's slow compartments and probably in intermediate compartments. When the diver starts to ascend, and the ambient pressure starts to drop, the gradient begins to reverse — first in fast compartments and then in progressively slower compartments. Effectively, during and after surfacing, most of a diver's tissues will be supersaturated in comparison with the ambient pressure. If the degree of supersaturation is modest, inert gases can travel in an orderly manner from the body's peripheral tissues into the blood and then to the lungs, from where they can be exhaled to the atmosphere. But if the degree of supersaturation is too great, the elimination of inert gases becomes disorderly. 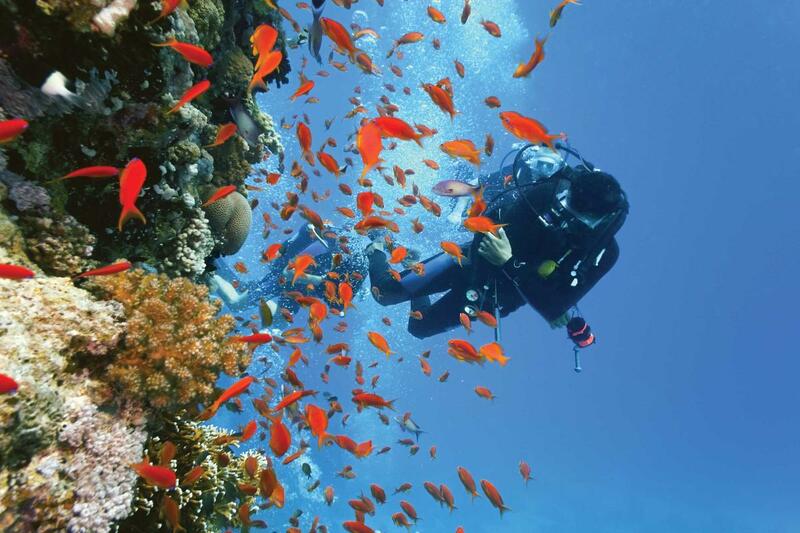 In this case, gas bubbles can form in the tissues of the diver's body. Bubble formation does not always cause problems, but the higher the gradient, or degree of supersaturation, the greater the likelihood that signs and symptoms of DCS can occur. It is a dangerous misconception that measurable bubbles form after all dives and are of no importance. But at the same time, it is a misconception that bubbles visualized in the blood stream in and of themselves signal DCS. The formation of gas bubbles during decompression represents a stress greater than is optimal and may lead to DCS. It is best to follow conservative dive profiles to minimize the likelihood of bubble formation. The greatest difficulty is in knowing what counts as "conservative," since most divers have never been monitored for bubbles, and uptake and elimination is altered by a number of factors in addition to the pressure-time profile. The half-time compartment calculations are used to generate exposure-limit predictions for a range of hypothetical compartments. In paper or plastic form these are known as "dive tables." Modern dive computers allow for much more flexible guidance since they are able to continuously monitor the pressure-time profile and simultaneously compute the status of a variety of theoretical tissue compartments. But in reality, the picture is much more complex. Gas exchange is influenced by more than just the pressure-time profile. So while it is important for divers to understand the concepts behind calculating half-time compartments, divers must also keep in mind that a wide range of factors can influence gas uptake and elimination and effectively alter decompression risk. 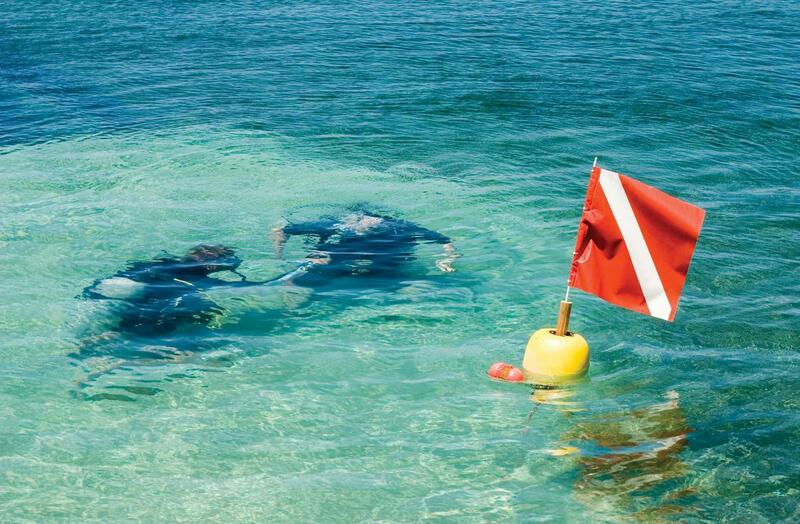 Thus the onus is on the diver not to rely too heavily on a table or device for safety.